1 of 4 Heat oven to 350 degrees . Line fifteen 2 1/2-inch muffin cups with paper baking cups. 2 of 4 In a large bowl, whisk together flour, poppy seeds, baking powder and salt. Set aside. In a second large bowl, beat butter and sugar on medium-high for 2 minutes, until light and fluffy. Gradually add in eggs, one at a time, until just combined. Beat in extracts, lemon juice and zest. On low, beat in flour mixture, alternating with milk, until just combined. 3 of 4 Evenly spoon batter into prepared muffin cups, filling each about three-fourths full. Bake at 350 degrees for 20 to 21 minutes or until a wooden pick inserted in the center comes out clean. Remove to a wire rack and cool completely. 4 of 4 Fill cupcakes by placing lemon curd in a pastry bag fitted with a medium star piping tip. Press the end of the tip into each cupcake and gently press until top of cupcake starts to rise up a little. 1 of 2 Heat broiler. Place egg whites in a clean bowl and beat on medium-high until foamy. Beat in cream of tartar and gradually add in sugar. Beat until stiff peaks form. 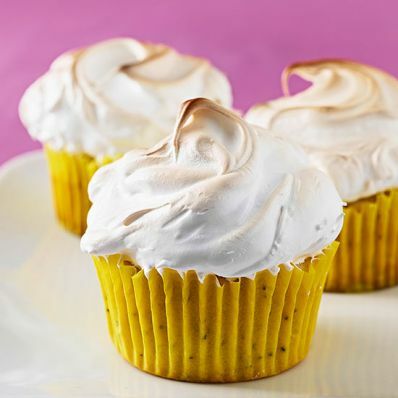 Frost each cupcake with meringue. Broil 6 inches from heat for about 45 seconds, until tops start to lightly brown. 2 of 2 Refrigerate for 1 hour before serving.